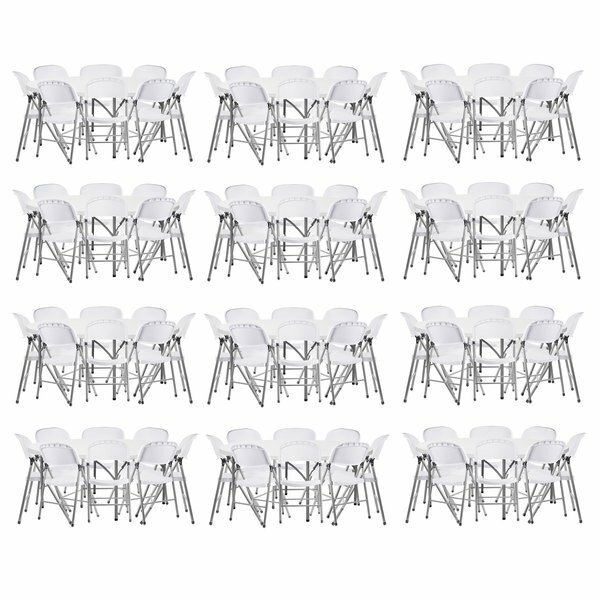 This Lancaster Table & Seating (12) 72" round granite white heavy duty blow molded plastic folding table with 96 white folding chairs is a great addition to offices, lunch and break rooms, lecture halls, or catered events! Including 12 folding tables and 96 matching chairs, this set provides you with everything you need to easily offer guests a place to sit, learn, converse with others, or enjoy a meal. It allows you to set up 12 tables with 8 chairs each, helping to fill out any banquet hall or conference area.